New to Dragon Age? Start here! You can check out the Dragon Age RPG for free with our Quickstart PDF. It includes basic rules, pre-generated characters, and a short adventure to get you started. The Dragon Age RPG was originally released as three boxed sets that took your characters from level 1 through 20. 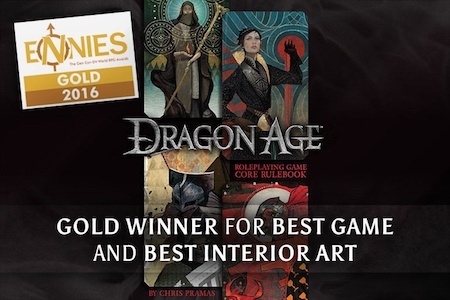 Now all three sets are combined in the award-winning Dragon Age RPG Core Rulebook, for one-stop shopping! While the Dragon Age Core Rulebook includes three adventures, Game Masters can never have too many! The Dalish Curse appeared in Dragon Age Set 1 (now out of print and consolidated into the Core Rulebook). You can download it here, for free adventuring in Thedas! This is the first adventure collection for the Dragon Age RPG. It includes three full-length adventures and three adventure outlines for low level characters. If you need more scenarios for your game, this is your first stop. This handy accessory includes a hardback GM screen that puts useful tables and charts right in front of the GM for easy reference in play. It also includes handy reference cards for the GM and players, along with a 36-page adventure in the Deep Roads. All of the releases detailed above are available as PDF format in addition to print, however we also have a line of PDF-only products. These are generally short, focused, and reasonably priced. Tallis is Felicia Day’s character in the Dragon Age web series Redemption. This PDF details Tallis’s history and background and includes stats for her as well. It also includes an interview with Felicia about Tallis. And did we mention it’s FREE? Players of the Dragon Age II video game are well-familiar with the charming rogue Varric. Now you can add him to your Dragon Age game! The Wyvern was introduced in the Mark of the Assassin DLC for Dragon Age II. This fearsome opponent is now available to strike fear into your players!